A mammogram is an x-ray examination of the breasts. It is used to aid in the diagnosis of breast diseases in and is the primary means for early detection of breast cancers. The American Cancer Society recommends that women have annual screening mammography beginning by age 40. The National Cancer Institute recommends that women who have had breast cancer and those who are at increased risk due to a genetic history of breast cancer should seek expert medical advice about whether they should begin screening before age 40 and about the frequency of screening. A diagnostic mammogram is used to evaluate an abnormal clinical finding, such as a breast lump, that has been found by the woman or her physician. The mammography division of the Imaging Center is accredited by the American College of Radiology. The mammography technologists are ARRT certified in mammography and all exams are interpreted by Board Certified radiologists with a sub-specialty in mammography. Hartford Hospital, as the largest and most comprehensive breast care provider in our region, feels a commitment to ensuring that all women in our region have access to this potentially life-saving technique. Through its comprehensive breast care program, the Partnership for Breast Care, and its Helen & Harry Gray Cancer Center, the hospital and its medical staff provide an array of prevention, outreach, diagnostic, treatment, support, research, and educational services related to breast disease and breast cancer. The Imaging Center offers digital mammography. Studies have shown that digital mammography can improve detection of breast cancer in some women. Digital mammography differs from film mammography in much the same way digital cameras differ from film cameras. In digital systems, the film is replaced by detectors that convert x-rays into electrical impulses. These signals create images that can be viewed on computer screens or printed like traditional x-rays. The patient experience, however, is the same. In conjunction with digital mammography, computer-aided detection (CAD) provides a "second read" of the mammogram by a computer. The combination of CAD and specially-trained radiologists provides the best environment for an accurate diagnosis. In addition to mammography, other breast imaging services are available including breast ultrasound, breast MRI, fine needle and breast wire localizations, stereotactic biopsy, galactography and lymphoscintography. 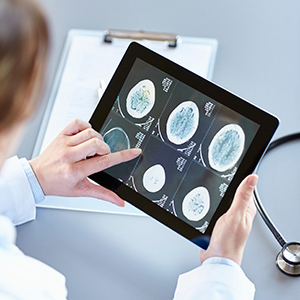 All diagnostic images and reports are stored electronically in one location, and hard copies can be produced immediately if needed. This digital technology allows for more computerized analysis of a breast exam than was possible with film mammography. A study involving 42,760 women nationwide found that digital mammograms were more accurate for more than half the women who get breast-cancer screenings. Younger women with dense breast tissue -- which makes it harder to detect tumors -- particularly benefited from use of the new technology, the study found (HealthDay). Digital mammography also provides better imaging for women with breast implants. Other breast imaging services are available including breast ultrasound, breast MRI, fine needle and breast wire localizations, stereotactic biopsy, galactography and lymphoscintography. All diagnostic images and reports are stored electronically in one location and hard copies can be produced immediately, if needed. Take The Time Mobile Mammography Program furnishes the same high-quality mammograms as those available at the imaging center. Receiving a mammogram typically takes no longer than 20 minutes. All mammograms performed on the mobile unit are screening mammograms. To find out when the Take The Time Mobile Mammography coach will be in your area, or to schedule an appointment or request a site visit please, call 860.972.1141 for more information. The Hartford Hospital Imaging Center is accredited by the American College of Radiology for Mammography and Stereotactic Breast Biopsy. When you arrive, we will review your medical history and any past imaging procedures with you. Our mammographer will explain the exam and answer any questions you may have at this time. You will be asked to change into a gown before your examination. Our mammographer will ask you to stand in front of the mammography machine. It will be raised or lowered according to your height and your breast will be positioned on the platform. Each breast is imaged separately and will gradually be compressed with a clear plastic plate. Compression may feel tight but should not hurt. This is needed to ensure a clear picture, reduce motion and to reduce the amount of exposure necessary. Our mammographer will monitor you closely and minimize any discomfort. You will be asked to change positions slightly between images and asked to hold your breath when the picture is taken. The examination process should take approximately a half hour for a screening mammogram and up to one hour for a diagnostic mammogram. Please schedule your examination the week following your menstrual period, when your breasts are less tender. Please do not apply underarm deodorant, powders, ointments or creams to your chest area the day of your scheduled exam. These products can show up on the images. Please remove all jewelry and other items to avoid possible interference from metal fasteners in clothing.